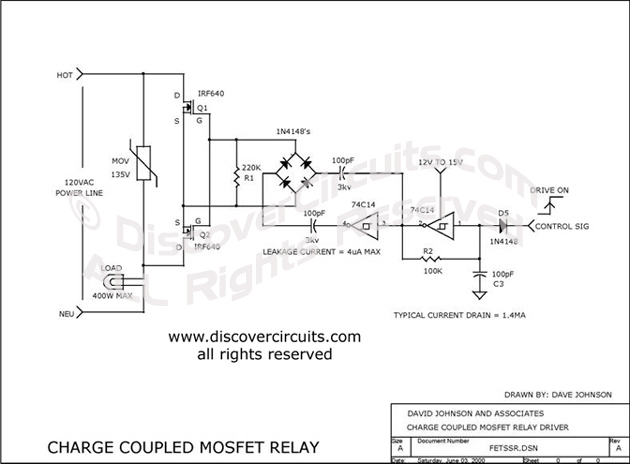 Circuit: Charge Coupled Bi-Directional Power MOSFET Relay __ Circuit designed by David A. Johnson, P.E. The circuit uses an inexpensive C-MOS inverter package and a few small capacitors to drive two power MOS transistors from a 12v to 15v supply. Since the coupling capacitor values used to drive the FETs are small, the leakage current from the power line into the control circuit is a tiny 4uA. Only about 1.5mA of DC is needed to turn on and off 400 watts of AC or DC power to a load.